New Delhi: The National M.Sc Medical Teachers’ Association (NMMTA) has sought fair treatment for the biomedical post graduate degree holders from the government. To press its demands, the association that has members across India, organized a second round of protests at New Delhi on 20th August 2018. Around 100 teachers, students and scientists participated in this event that was supported by the Society of Young Scientists, AIIMS Delhi. The protesting members sat at the Parliament Street and raised slogans against the MCI. Many members including the President of NMMTA addressed the gathering. After the protest, a memorandum along with signatures of protesting members were submitted to the health minister. 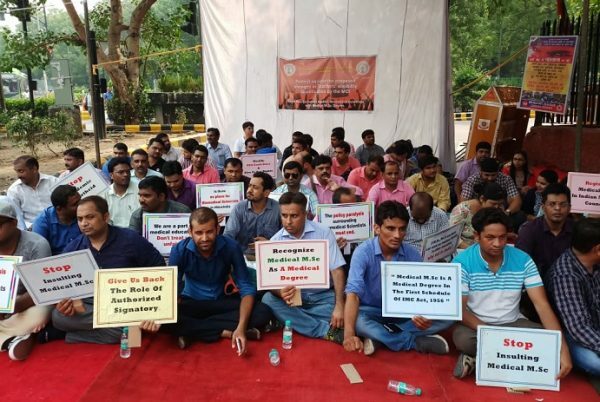 Earlier the NMMTA had also organized a protest (Delhi Chalo -I) against the exclusion of biomedical scientists from the signatory role under the guidelines of the Clinical Establishment Act. Several findings and reports, including those of the parliament’s standing committee and NITI Aayog, have consistently found fault with the way Medical Council of India (MCI) handled medical education in India. MCI was tasked with “maintenance of uniform standards of medical education”, in which it had failed miserably. Barring few exceptions, the current standards of medical education are abysmal. It is no wonder that despite having 460 medical colleges, not one features in the global top 100 ranking. With the possible replacement of MCI with the National Medical Commission (NMC), India is set to change the way it conducts its medical education. MCI recognizes and regulates only those courses that are mentioned in the First Schedule of the Indian Medical Council Act. Medical M.Sc, a 2-3 year postgraduate course conducted in the medical colleges was originally included in this list. As per NMMTA, the MCI now claims that it has nothing to do with these courses. “Despite this, persons with Medical M.Sc degree are eligible to be appointed as teachers to the extent of 30% (50% in Biochemistry) in the non-clinical subjects (Anatomy, Physiology, Biochemistry, Pharmacology & Microbiology) as per MCI’s Teachers’ Eligibility and Qualification guidelines. Now, MCI proposes to reduce the ceiling to 15% (25% in Biochemistry) and to stop it altogether after three years. It has sought the opinion of a subcommittee formed by itself for this purpose,” elaborates the statement from NMMTA. Medical M.Sc courses, which are conducted in the medical college on the curriculum and syllabus similar to that of M.D courses, are awarded by the health universities under the faculty of medicine. The health ministry has clarified that medical M.Sc courses don’t come under paramedical or allied health profession. By virtue of their ‘medical’ education, medical M.Sc postgraduates are eligible to render their services as ‘non-medical’ teachers in medical colleges, consultants in diagnostic laboratories and scientists in research or pharmaceutical institutions. Since the degree is ‘medical’, they don’t find opportunities outside the medical field. “One by one, the professions for which these postgraduates were educated, trained and skilled are being denied. Despite the honorable Delhi Court stating in its judgment that these postgraduates can sign technical reports in the diagnostic laboratories, the health ministry has denied them the rights under the guidelines for laboratories in the Clinical Establishments Act. This is a grave mistake, which has affected thousands of biomedical scientists, including the ‘non-medical’ teachers,” mentioned NMMTA statement. • Form a committee under health ministry or a parliamentary committee to discuss all the issues. • Define the roles for biomedical scientists and plan how many are required for the next 5-10 years. • Standardize the conduct of these courses, bring them back into the first schedule of the IMC Act. Let MCI regulate these courses. There must be cap on number of seats. • If this is not possible, constitute a separate council for the biomedical scientists distinct from Allied or Paramedical profession. • Both non-medical and medical teachers are required for wholesome & balanced medical education, there must be a reservation of up to 30% for non-medical teachers in the non-clinical subjects. • MD courses in Anatomy, Physiology, Biochemistry, Microbiology & Pharmacology be reduced; India needs more doctors to practice in the area of public health than merely teach in the classrooms. • Biomedical scientists with Ph.D should be tasked to head the research divisions. • State governments, universities, Pharmaceutical and R&D companies must be encouraged to fund research in the form of grants. • Teachers should be appointed on merit; mere possession of a certain degree or the lack of it is not an indication of the person’s ability or inability. • Introduce a NET-like examination for the selection of teachers in the medical colleges too; let medical students get the best of both the degrees. • Rating of teachers, departments and colleges by the students as a part of feedback is a must. • The guidelines of the diagnostic laboratories under the CEA must be amended to include consultant roles for the biomedical scientists. • Govt must give importance to training, competence and certification instead of relying merely on academic qualifications. • HRD ministry must make amendments to include medical M.Sc candidates for UGC-CSIR NET tests as the syllabus is entirely different. • ICMR must provide funds to non-medical teachers for pursuing Ph.D as it gives to MD students. • Age for the post-doctoral fellowships must be raised for non-medical teachers. • All health universities must offer post-doctoral fellowships in basic medical sciences.